A lot of times we talk about change. We plan to change. We make diagrams on what we need to change. Some times we already know what we need to do without having to plan. Then we stall and don’t change. All talk, no action. I’m the first to admit that change is hard. I like my routines, my habits. I work with clients on a daily basis to learn new habits, to replace old habits, and to figure out how to get change started. Most of my clients are weight loss clients in various stages. Some are morbidly obese with 75 – 100 lbs or more to lose. Some only want to lose a little. I also have clients all over the spectrum in between. The common thread that they share is that they struggle to change, and I’ve got some interesting thoughts for you on this. It might come as a surprise but once you think about it, it makes complete sense. In fact so much sense that you can apply it to other aspects of your life that aren’t weight loss, eating, or workout related. Your actions control your results. That’s the easy part that most of us know. You do this and you get that. You don’t do this and that never happens. No surprises there. The secret is that every action begins with a thought. It can be a negative thought or a positive thought, but that thought is the beginning of action or inaction. Our thoughts control our feelings. We think something is fun, we experience joy and excitement. We think we’ll dread or fear something, and it’s that self fulfilling prophecy. The beginning of your process is a thought that you may not even realize has happened. That thought creates a feeling and the feeling drives the action. If you try to initiate change without knowing the thought behind it, the majority of the time you’ll fail. If you can back your way up the chain from the action to the feeling and back into the thought, you can understand what’s going on. That knowing and understanding is what can really make a difference because you are in control of your thoughts. No one else. Good or bad. 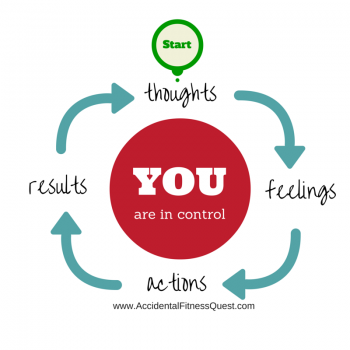 You are responsible for and in control of your thoughts. You are also the one who can change them. Let’s use an example. Maybe you want to start a workout program. You plan your workouts, the days you’ll go, you join a gym… but you never quite make it there. Examine the feeling you have right before you decide not to go. What is it? Apathy, fear, worry, frustration, complacency? When brainstorming with clients, I find that fear, embarrassment, and apathy are the biggest feelings behind not going. They worry they’ll look silly or they don’t know what they’re doing. That’s easy to resolve. We map out a specific workout plan, review exercise tutorials online, role play scenarios. Apathy often stems from thinking about all the other times that they tried and it didn’t work. If it’s not going to work, then there isn’t a point in trying again. We can work in baby steps that bring small but consistent changes and boost their confidence in making progress this time. Other clients struggle with overeating. Every time you eat when you aren’t hungry, it’s the same idea. You reach for the food because of an emotion, and that emotion was caused by a thought. You’re frustrated, feeling deprived, angry, happy. Name that emotion and figure out what thought started it. Thoughts identified and you can then work on changing them. If you try to start by changing the action without changing the thoughts and feelings behind it, you may be able to make a short term change but it won’t last. Why? Because you’re fighting against yourself and that’s a losing battle. Decide on the action that you want to take, identify the feelings you have right before you take that action, and work your way back to the initial thought. That’s one of the secrets to being able to make long lasting changes. If you need help identifying the thoughts holding you back or breaking down the thoughts into small goals that are doable, habit-based coaching may be for you. Let’s talk about what we can achieve together. Drop me a message at adrianne@GrowthStimulusTraining.com. You can also follow me on Facebook for some great tips, ideas, and more.